Will the New Co-Branded Galaxy Tab 4 Nook Do Well in a Tepid Market? Barnes & Noble is sending out invites today for a press event in two weeks. They haven't revealed any specific details about the topic, but the invite, which you can find here, drops enough hints to let us know that we're finally going to see the next Nook hardware. The retailer had announced in June that the next Nook device would be made by Samsung, but did not share any details about price, specs, or the release date, which was tentatively set for early August. 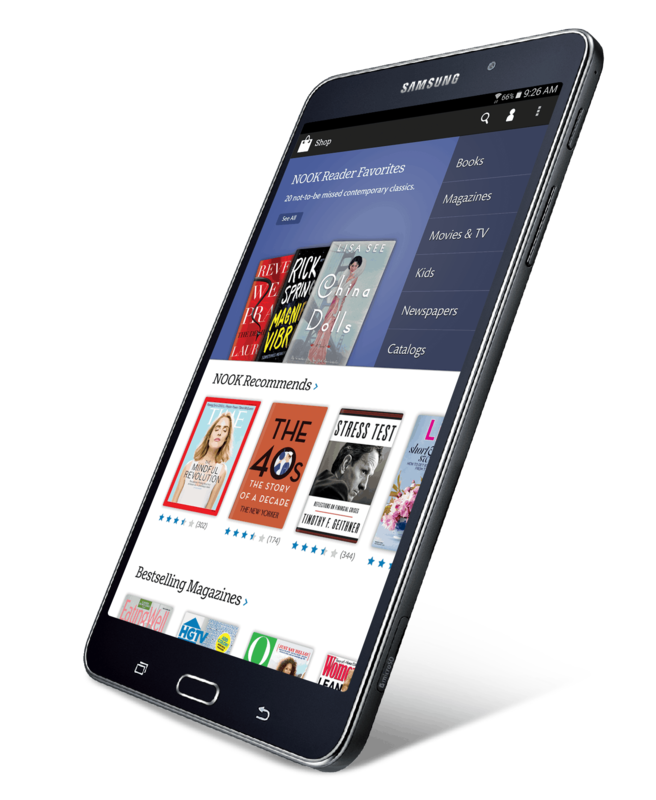 Based on information released in the Nook Developer section of the B&N website, I can now confirm that the Samsung Galaxy Tab 4 Nook, as B&N is calling it, is indeed the Samsung Galaxy Tab. It sports a 7" screen, and according to the specs shared by B&N it will be running Android 4.4 on a 1.2GHz quad-core CPU with 1.5GB RAM, and 8GB or 16GB internal storage. B&N also says that there will be a microSD card slot, a pair of cameras (1.3MP and 3MP), a 4Ah battery, Wifi, and Bluetooth. And most importantly, the Galaxy Tab 4 Nook will have a screen resolution of 1280 x 800, fewer pixels than on the Nook HD. Those are pretty much the same details as the specs for Samsung's version of the tablet, and in fact B&N also links to a set of publicly available Galaxy Tab 4 specs as confirmation. But to be nitpicky, until I found that page on the B&N website no one knew for sure whether the specs would be the same. The new Galaxy Tab 4 Nook is most likely going to ship in the days immediately after the launch; I would not be terribly surprised if it was available on the 20th. B&N is set to also release a 10" Nook later this year; according to the SEC filing on the Samsung-B&N contract, the larger tablet is going to be a rebranded Galaxy Tab 10.1. It is scheduled to ship 60 days after the launch of the 7" model. B&N is under contract to buy a million tablets from Samsung before the end of 2014. I'm not convinced that they will pull it off, but that really depends on the market. For example, if Amazon doesn't release an updated 7" Kindle Fire tablet later this year then B&N will have less competition for the new sales. All we know at this time is that Amazon has a slightly revised 8.9" Kindle Fire tablet in the works; leaked benchmarks have revealed that in terms of hardware it will be a minor improvement on last year's model. We don't currently have any details on any new 7" model, and that could be to B&N's advantage. As a consumer. I think replacement is the issue. The penetration has gone so fast that it’s reaching an amazing degree and therefore it becomes more of a replacement market, and the level of innovation in the past year has not been as great as it had been in the previous two years. So, there again, the jury’s out in terms of what’s going to happen, because it’s going to depend on what innovation comes to market. But you need a reason to replace. I know that many are focusing on the word crash, but I would suggest you ignore that word and simply consider what he said about the market. The thing is, I am seeing the same trends and I'm not sure he's wrong. I am looking at new devices launched this year and I'm not seeing any major improvements over the models launched last year. That strikes me as a good reason for anyone with a year old tablet to continue to use it instead of upgrading to a new model, or if they buy a new one to instead get a device released last year when it goes on clearance. And if no one is upgrading, B&N is on the hook for a million tablets which they might not be able to sell. B&N Partners with Google to Take on Amazon, But is This Really a Threat? What really annoys me is that display quality, assuming it really is the same as the Galaxy Tab. Why would I downgrade my screen over the existing Nook HD, and why would I get the new Nook instead of the Kindle Fire HDX, which has a gorgeous screen? Cost would be one reason, but I agree with you. B&N is going to be hard pressed to make those numbers with this device. I don’t care for the Nook HD but if I had one I certainly would not replace it with the new Tab 4 Nook. Even if it broke I would instead go for a refurb or a new Nook HD. It’s cheaper and has a better screen. But to be fair to B&N, it’s not like they really had a choice. No one is using a 7″ screen with the same resolution as the Nook HD, so whatever tablet they went with would be stuck with a lower resolution screen. Really? Is there no one who has a better screen resolution in the 7″ range? I know the Nexus 7 (2013) does. Are they it, other than the Fired HDX? Obviously I’m spoiled. I finally sold my Nexus 7 (2012) when I noticed the difference between it and my Nook HD. I though it was my imagination at first and then I checked the specs. No, wait. You’re right and I’m wrong. The Nexus 7 2013 does have a better screen resolution (1920 x 1200). So does the Kobo Arc 7HD. Let me go see if there are other models with that screen. Whew! Thought I was losing my mind for a minute. You look at and review so many tablets that you had me doubting myself. Now that I have my facts straight, I gotta wonder why B&N settled on a tablet with a lower res screen. Surely they knew everyone would be making the comparison and faulting the Tab 4. Hard not to go on a long rant about it. If this tab does well or not depends on price. It’s a 100$ tablet sold for 200$ by Samsung, if B&N sells it for 100$ it would do ok.
Now moving on to the tablet market, we had no exciting tabs launch this year or last year. Even the Nexus was kinda bulky, lacking some features and went from 200 to 230$ – sales down compared to the first Nexus 7 are proof that the device is not that exciting. Most tab makers are PC makers and they seem to have not changed their habits of doing nothing to better their products besides adding a faster chip every year. You look at tablets like this one that were 150$ or so with 16GB NAND last year and you see the same pricing this year. What the hell is that? HP is just messing around , Asus went “Incompatibility Inside” , LG went low end and high price instead of making a better and cheaper G Pad. Samsung has Apple pricing and that’s 40% too high. Sure the China market is awesome in comparison but it’s yet to really spill over to other markets. Sure the market is crashing, not because there is not demand but because there are no compelling products. i need a tab myself and i know a bunch of people that need a tablet but we are all waiting for one worth buying. I’ll most likely buy from China once there are more products with the new faster SoCs , didn’t wanted a quad or octa A7. Guess the LG G Pad was just 230$ today on newegg and there have been such deals before, a pretty good deal but it kinda needs an update, it’s not all that fast anymore and a bit bulky. What’s so hard about making a good tab? They are evolving like smartphones did. Thinner bezels, higher res and better price for more perf. How many 1080p 7-8 inch tabs can be found in stores in the western world? How many of them are not hugely overpriced? Nexus and ……..
And everybody gave up on 10 inch because they were not selling at 500$, ofc they weren’t selling at 500$ , it’s just too much and they should target 300$ for a nice 10 incher, that fact has been a given for years now. And this has been the state of the tablet market for a while now. When the Nexus 7 2013 launched i said that the saddest part about this imperfect tablet is that it will be the best 7 incher for the next year and it turned out that’s how it went (excluding China) Guess the Asus Memopad HD was somewhat exciting last year too, it had a pretty good value per price ratio but that was a long time ago. The tablet market really needs a kick in the …. , someone got to make a great device to push others forward too, something like the Tab S 8.4 but at 250$ or a nice Nexus. We need Nexus moments , or Amazon Tab moments ,otherwise it seems that the market gets stuck. At least 20nm and A57 cores should help a bit soon enough but that’s not enough if tablet makers don’t work on bezels/size and price and screen res. Speaking of market disappointments, don’t forget that there’s no new Nexus 7 this year (so far). And as for the price of the Galaxy Tab 4 Nook, this is Samsung hardware so it’s probably going to cost about 20% to 30% more than it’s worth. There were those rumors about the Nexus but it was 4:3 AR and too pricey so i really hope the leaks/rumors were fake. As for this Nook thingy, hard to say what kind of deal B&N has with Samsung, doubt they are buying it at 200$ so they could sell it cheaper if the contract allows it. Either way it’s not exciting and we should be getting better perf in the lower end soon with new SoCs. A7 and A9 cores are just about done. I thought those rumors were for an 8″ Nexus tablet? I don’t really recall those rumors; I didn’t find them plausible. My rule on Google hardware matches my rule on Apple hardware; ignore the rumors and wait for the leaks. I don’t recall any Nexus tablet leaks, just a couple rumors. Yeah 8 inch but that’s close enough to 7 inch and very unlikely for Google to have both 7 and 8 inch. 8 inch wouldn’t be bad , bezels got thinner over time and screens cheaper so it could work well enough in getting close to the Nexus 7 in size and price, if they would aim for that and not 100$+ higher. I also got to make a correction, i said in my first post a Tab S 8.4 like device at 250$ but i was thinking FHD screen not high res like the 8.4. 250$ for 1600p would be Xiaomi level pricing and i don’t dare to dream for anything like that just yet. I have to disagree with you on the screen size. A 4:3 8″ tablet is no where near the same size as a 7″ tablet, most of which have a screen geometry which is taller and narrower. And I have several 8″ tablets on my desk; they’re much bigger than 7″ tablets. Pretty much the only advantage to the Tab 4.